The meat of this pig, reared in summer pastures and fed by the waste of milk production and herbs and roots, has a very special taste and aroma; and moreover it is lean, tender and easily digestible. For whatever preparation is used, the result will always be excellent. This time I prepared it, very simply, in the pan; marinated briefly and browned with olives and capers. These days we have the return to the valley from the pastures: let's see if I can get these cuts of meat again (it is not that there is a large amount on the market) and to propose other preparations! I usually indicate here a detailed list of all the ingredients but here I think everyone has to decide which aromas he prefers to accompany this particular meat. Let's start by pulling the meat out of the fridge at least a couple of hours before cooking: passing it from the fridge to the hot pan we would certainly ruin it. Crush the garlic and mix it with the other aromas, the oil and the lemon juice. Season the chops with this marinade, rubbing it well and, after half an hour, turn and massage them again. The meat must marinate for at least an hour. and just put the chops on it. Cover them with the possible advanced marinade and rest of the marinade and add the olives all around (better if pitted); cook over medium heat for four to five minutes. Turn the meat, mix the olives and the capers (maybe pour a little on the chops) and blend with a little white wine. Allow to cook for another four minutes, covered, then remove from heat and allow to stand for a few minutes before going to the plates. 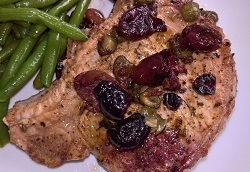 Serve the chops covered with olives and capers and accompanied by boiled potatoes or green beans (as in the pictures). Other will not be necessary except that a little salt for those who still wanted it. A curiosity: for many years the pigs were no longer brought to the alp: unlike cows and goats are not so neat and docile to march all in a row and require constant attention (or leave quietly to the fort). Moreover, a pig that lives on a mountain pasture, always on the move, does not become as heavy as a pig put to fattening, so selling it by weight does not repay the efforts made to raise it. In recent years, however, in order to encourage mountain farming (traditionally poor and low profitability), the main Swiss chains of large-scale retail trade have promoted this breeding, paying farmers the pigs per unit and not by weight and thus creating an additional source of income. Clearly, the retail price, for consumers, is not that of farmed pigs.